Supreme court of Azerbaijan, 2016. Photo (c): Murad Orudzhev / RIA Novosti. All rights reserved.Samed Rahimli is a Baku-based lawyer with a long track record of advocacy for detainees in Azerbaijan’s jails. This year, Rahimli co-founded Praktik Hüquqşünaslar Qrupu, an advocacy initiative determined to oppose new changes to Azerbaijan’s legal profession. 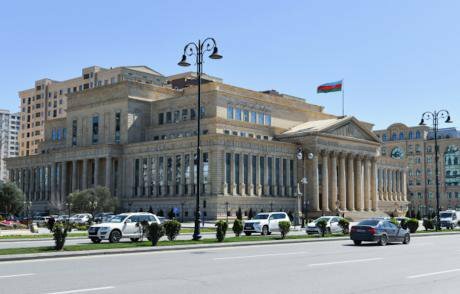 On 31 October, Azerbaijan’s parliament approved amendments to the civil code which give the state-controlled bar association full control over practicing law in the country. Azerbaijan’s lawyers are either licensed members of the bar who have had to take a highly politicised examination, or “hüquqşünaslar”, registered lawyers who are not members of the bar, but are entitled to represent their clients in non-criminal cases. The changes could lead to thousands of lawyers becoming unable to represent anybody in a court of law. Observers have already decried the move as part of an intensifying crackdown on the handful of human rights lawyers who still remain in the country (following the legislative changes, some lawyers have reported being called to their local police stations). Justice in Azerbaijan has never been easy to obtain. As part of oDR’s series of interviews with human rights lawyers, I asked Samed Rahimli why these changes could make it even rarer. What’s at stake with these new amendments? How can we understand this recent crackdown on Azerbaijan’s lawyers? Samed Rahimli: Look at the historical context. In Soviet Azerbaijan, there was no such thing as an independent attorney or lawyer. Institutions of attorneys and lawyers (i.e. the bar associations) were under state control. After independence, these state-controlled bar associations came under scrutiny, and calls were made to establish a new independent attorneys’ institution. The established bar associations were not pleased, they didn’t want to lose their influence. Establishing alternative legal institutions was also debated at length in Russia, Ukraine and other post-Soviet states. There were attempts to reform the system. In 1998, a system of licensed lawyers was established in Azerbaijan, separate from the bar association. Lawyers could receive a license from the Ministry of Justice to practice and thus to represent clients at local courts. This system was soon eliminated, as the government considered it unnecessary. Azerbaijan’s legal system soon divided into two groups: the bar association itself, and lawyers who wanted to function independently. The state, of course, was interested in empowering the traditional bar association, which they kept under strict control. Thus bar associations came under the rule of those with a very top-down, Soviet-era approach to law, and those closely affiliated with the ministry of justice. Legislation was drafted to allow members of the official bar association to more effectively practice law and engage with state institutions — and independent lawyers were sidelined. Around the same time, a new civil code was adopted in Russia. It allowed lawyers who were not attorneys (i.e. members of bar associations) to represent individuals in civil rather than criminal cases. In 2000 Azerbaijan followed suit, and lawyers here soon started representing clients in civil cases without being members of the bar. Thus, attorneys dealt with criminal cases, and independent lawyers dealt with civil (i.e. administrative) cases. Once Azerbaijan became a member of the Council of Europe (CoE), it committed to reforming its judicial system. However, these reforms were never completed — largely due to the authorities’ lack of interest. A new bar association was eventually established in 2004 — and was supposed to have included those independent lawyers once licensed by the ministry of justice as well as the attorneys from the old bar. There should also have been a founding conference, with an organising committee consisting of three attorneys and three independent lawyers, each chosen by their respective colleagues. But the government changed the law — as a result, all lawyers on the committee had to be appointed directly by the Justice Ministry. This move clearly violated the independence of the constituent assembly, to the advantage of attorneys favoured by the state. From the very start, the independence of this reformed bar was undermined. Veteran human rights lawyers İntigam Aliyev and Annaga Hajibeyli were supposed to have been engaged in the process, but were barred from directly participating in the founding meeting and it was held without their involvement. Later in 2004, they were punished for continuing to practice law independently, and by 2005, the rest of those lawyers who did not participate in the new bar’s founding conference had to take an exam to the bar association. Increasing numbers of them were rejected, in a clear attempt by the association to limit its membership. Lawyers of the bar association-affiliated law and consultancy centre such as Namizad Safarov and Latifa Aliyeva, who dared to hold independent elections for their chairpeople, were expelled from the association in 2006-2008. Essentially, any lawyer with an NGO background started to have difficulties during the entrance exams to the new bar. Many were no longer accepted as members. The exam process was entirely opaque, and there were no objective criteria for the interview. From 2010 onwards, all lawyers dealing with politically sensitive cases started being removed from the bar association. After all, it made sense for the bar’s new head Azer Tagiyev to slim down the association’s membership — he did his best to reduce the number of attorneys as much as possible. Exams were held less frequently, and over the past 13 years, lawyers were examined for a new intake to the bar only four or five times. So, we ended up with two groups of lawyers. On the one hand, those dealing with political or NGO-related cases started not attending meetings of the bar association, nor bothering to apply to join it. On the other, there were many lawyers who weren’t interested in criminal nor political cases, and were allowed to attend civil cases without being members of the bar anyway. By the 2000s, the legal profession in Azerbaijan largely existed outside the confines of the bar association, which had come to be seen as a very closed organisation with complicated public relations, to put it mildly. So what exactly happened in October with these new amendments? Why did this state of affairs only become “a problem” for the authorities so recently? SR: Until October, the courts and authorities did not publicly question the situation. Then in October 2017, the new amendments were enacted and a very short period of time given to lawyers before they have to cease practicing. Many of them don’t even have time to complete their current cases, let alone try applying again to the bar association. Most of the legal community has been exempt from any kind of official representation, and now that’s come back to bite them. It’s a very serious problem. The entire future of Azerbaijan’s legal profession is under threat. And what concrete problems do these amendments spell for those practicing law in Azerbaijan today? SR: Well, lawyers deal with two jobs. They provide either legal consultation or representation. Some lawyers may limit themselves to legal the former, but most represent their clients before the authorities, in courts and other institutions. And if a lawyer doesn’t engage in this kind of representation, his awareness of law will be very theoretical, with little practical experience of the court system. Samad Rahimli (left), with lawyer Ziya Guliyev, and NGO worker Hasan Huseynli. Photo courtesy of Samad Rahimli.A contradiction will emerge between the conceptual law and practical law. Thus, with this regulation, 90% of lawyers in the country are deprived of this practice. The remaining 10% — members of the bar association — have serious problems. They basically focus on criminal cases and most of them are quite old. They are have a Soviet background and are not interested in improving themselves. They do not have the same goals as the young generation and are not interested in contributing to the law profession. That is to say, this legislation excludes 90% of lawyers, in particular the younger and more productive ones, from representing clients — the basis of legal practice. This is a very serious problem. 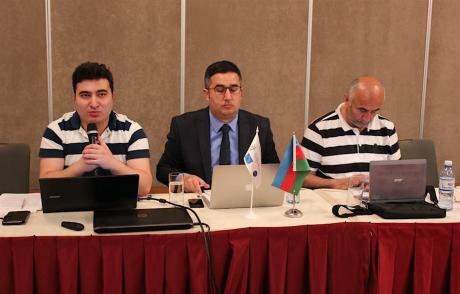 What will be the impact on Azerbaijani society as a whole? SR: Well, worse than the impact on lawyers, that’s for sure. We have a saying in Azerbaijan that nobody will have problems if they’re aware of their rights. But ordinary people are under no obligation to learn them. And law is not so simple. When somebody is ill, doctors should interfere. It’s the same with lawyers and human rights defenders. There are many legal issues that ordinary citizens are unaware of. Sometimes you need a professional to explain why you need to go to court and defend your rights — and citizens should have the full ability to hire lawyers, who know all the procedures, for that purpose. Now, if we estimate that there are 9,000-10,000 lawyers in Azerbaijan today (both members of the bar association and independent practitioners), then it’s possible that only 900 will remain after all these changes. Also remember that only around 100 of those 900 bar association members are administrative staff, who aren’t really engaged with the public as legal representatives. If the bar association eventually opens up and accepts new members, then perhaps there’ll be 1,500 court representatives available to the public — but until that happens, there’ll be just 700-800 available. There are roughly nine million people in Azerbaijan. Of course, not all of them require urgent legal assistance, but there are still just ten lawyers per 100,000 people in Azerbaijan today. Not only does this undermine the credibility of the jurisprudence system, but it also disenfranchises the public — particularly those from low-income backgrounds. Their distribution is also very unequal. Around 600 of these members of the bar association are based in Baku; the other 200 are in the regions. About three million Azerbaijanis now live in and around the capital of Baku, and about seven million in the provinces. Imagine what it means to have about 200 attorneys available for seven million people, compared to 600 lawyers for three million people. According to the CoE, Azerbaijan has one of the lowest ratios of lawyers per 100,000 people in Europe. What does this mean for people outside Baku if they attempt to seek justice? SR: It means that they may not get it. For example, there are two attorneys in Gazakh region, and just one attorney in Oguz region. There is a single attorney in the Zardab province. If two parties are in conflict, then region’s single attorney will defend just one person. The other has to bring an attorney from outside the province. Remember the difficult economic situation in Azerbaijan’s regions. At the moment, lawyers who are not members of the bar association will represent a client in court for a fairly small fee — around 300-400 Manat [£130-£175]. Members of the bar association ask for much more. It’s a problem of supply and demand, and prices for those few remaining attorneys are likely to rise as a result. What do you think are the political motivations for this move? SR: The government never discloses its actual position, but has alluded to a belief that attorneys rather than lawyers should deal with legal matters. The timing is important. Right now, Russia is having a particularly heated debate about access to legal representation, and our government is often “inspired” by Moscow in such matters. But Azerbaijan is in more of a hurry — Moscow has put forward a new five-year plan in Russia, according to which a new legislative framework should be established within five years, and all lawyers should become members of the bar association during the same period. The Azerbaijani government has allocated just two months: as of 1 January this new law, ratified by the president on 7 November, will be enacted. That’s a very small window of time — and crucially, no bar examinations will be held during the period. You should also bear in mind the corruption of Azerbaijan’s court system. Salaries are extremely low for court officials — especially those of judges at first instance courts. As such, the Azerbaijani judicial system could continue its work thanks to corruption. This includes the continued unlawful maintenance of court judges and employees via extra payments on top of their monthly salary. In this system, anybody who doesn’t resort to corruption would lose his job security. For example, those of us who bring cases to the ECHR often win. But we lose 90-95% of our work in Azerbaijan. Over there, our job is to go to court and lose. If we earn money via corruption, we are not independent. If we just fulfil orders from the authorities, we are not independent either. Essentially, the government has created conditions for corruption to thrive in the court system. and the court was in a full state of corruption. To some extent, things improved after the 2015 economic crisis. Everybody’s income decreased, and there was simply less money [to pay bribes]. Even businessmen were no longer interested in going to court and paying for legal counsel or defence to resolve their disputes. For corruption to continue, there has to be money. With fewer chances for legal representation, people will also have to come to court themselves and settle issues directly — spending money on the court system. So, I think, in that way a new form of corruption could be appearing — people will have less access to independent lawyers, and they’ll be more dependent on the corrupt courts, without any representation. Finally, remember that there were quite a lot of independently-minded people involved in advocacy work. Some of them were also involved in the NGO sector, and the authorities found it quite difficult to control their activities. It was a lot easier for them to dissolve the independent legal profession and supervise it through the closely-controlled bar association. Recent years have seen restrictions on almost all spaces in Azerbaijan, from political parties to media and civil society. Now, it’s the legal profession’s turn. Around 2,000 lawyers in Azerbaijan provide legal counsel and representation to the country’s large IDP population who were displaced during the Nagorno-Karabakh war. How will this affect these legal professionals? SR: The 2,000 counts only the acting lawyers registered by the government’s taxation department. Baku is running a project in collaboration with international NGOs to offer free legal assistance to IDPs in Azerbaijan. And to be blunt, it was a sham. Most of those involved in that project are lawyers, not attorneys. As a result of these new changes, projects such as this will have to end. A large number of humanitarian projects are focused on the regions, where there are already not enough attorneys to implement them properly. And how will it affect the IDPs? SR: Very badly. The government's general approach is that “we understand that the problems and will solve all of them by new year”, which seems absurd. You can’t solve the IDP question in so short a time. These latest laws aren’t the first instance of harassment of lawyers in Azerbaijan. Back in 2015, the human rights defender and lawyer Khalid Bagirov (to whom you were an assistant) was disbarred on ethics charges. The move was widely interpreted as payback for his public defence of the imprisoned opposition politician Ilgar Mammadov, among other prisoners. What can his experience teach lawyers today? SR: Bagirov’s case is an example of how attorney who does his job honestly is kicked out. Not just Khalid Bagirov, but also Yalchin Imanov's case shows that being a professional attorney engaged in conscientious work will bring the authorities down on you. The bar association not only failed to defend them, but actively supported the government’s punishments. After these cases, many attorneys realised that if they crossed the red line and crossed swords with the authorities, they would be penalised. As you can see, the number of attorneys attending to politically-motivated cases in court has remained the same — that is, the same handful of people: just five or six of the bar association’s 900 members. Why aren’t the other attorneys interested? Firstly, because this work is pro bono and they won’t get a fee. And secondly, because they’re really afraid. How do you practically plan to go forward with your work under these new circumstances? SR: I specialise in cases at the European Court of Human Rights (ECHR). As such, I can live off my legal fees. The fact also remains that Baku is keeping is very busy, and it seems that problems [concerning human rights] will only increase in number in Azerbaijan. We will continue our work in the ECHR. But of course, in order to bring cases before it, all available options for recourse via local courts have to be exhausted. We will find a way out. We will continue to help our clients who come to us for consultation. But I am in the minority; few lawyers in Azerbaijan specialise in the European Court, and even fewer have the opportunity to learn to do so. Meanwhile, lawyers in Azerbaijan’s regions are finding it extremely difficult to help anybody. In a word, they’ve been deprived of their right to practice their profession. Finally, Azerbaijan now risks being expelled from the Council of Europe (CoE) due to Ilgar Mammadov’s continued imprisonment. What might this mean for Azeri lawyers working with international organisations? SR: Look, Azerbaijan’s expulsion from the CoE is not a good result. Things should never have deteriorated to this extent, but unfortunately the current situation is simply because Azerbaijan failed to comply with a clear ruling by the ECHR. That’s how such organisations work. For its part, Baku has not complied with the standards it has formally adopted before international organisations. There are two sides to this dispute, but it is a clear mistake of the Azerbaijani government. If (or when) Azerbaijan loses its place at the CoE due to its non-compliance, then the country’s lawyers will no longer formally have any guarantees from that body. Yes, there are parallel guarantees reflected in Azerbaijan’s commitments to the UN — but Baku’s obligations before the CoE were more efficient and clear-cut. As such, the process will lead to a further negative impact on the rights of lawyers.